Joseph Dominic Baldez was 24 years old when his employer, the architectural firm D.X. 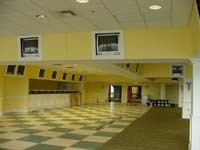 Murphy & Brother, asked the self-effacing, self-taught, draftsman to dress up the new grandstand at Churchill Downs. The year was 1894. Baldez's solution was the Twin Spires, destined to become the icons of horse racing that transformed Churchill Downs into the most recognizable racetrack in the world. Baldez, a Louisville native, was obsessed with symmetry and proportion, and there are many theories about his inspiration for the dual spires. The spire was a popular element in architecture during the late 1800s, and no doubt Baldez was influenced by similar spires used on the buildings at Louisville's Central Asylum, designed by the firm where Baldez had worked prior to his employment with D.X. Murphy. But perhaps his sense of symmetry was the result of his own disproportion: As a child, Baldez broke his knee falling out of bed and was left with a limp. In any case, to him, twin spires were just better than a single spire. Baldez's design for the racetrack's centerpiece is rather simplicist. As Baldez would later say, "They aren't any architectural triumph, but are nicely proportioned." The spires are octogonal, which, architecturally, is a strong, efficient shape. They are 12 feet wide, 134 feet apart from center to center, and rise 55 feet from the grandstand's roofline to the top of the adorning king posts. The roofs are slate, and the eight rounded windows of each spire, originally left open, have been glassed in to prevent rot and roosting birds. As a tribute ville's French heritage, a fleur-de-lis, the royal coat of arms of France, adorns the top of each window. Each fleur-de-lis is flanked by two rosettes, which were intended as purely decorative features. Roses didn't become a part of the Derby tradition until 1986 when pink and white roses were presented to the Derby winner in the form of a collar, not a blanket. The Twin Spires were unveiled to the public 110 years ago at the 21 st Kentucky Derby, Monday, May 6, 1895. It is difficult to believe only 10 monts earlier their construction seemed unlikely. In July 1894, the Louisville Evening Post reported it was "probable that there will never be another meeting at Churchill Downs." Today such a statement seems impossible. The Twin Spires, the most recognizable structures in all of horse racing and arguably in all of sport, were nearly never conceived? Following the lackluster 20th Kentucky Derby in 1894 (a field of horses the Louisville Commercial referred to as "a contest of dogs") and the closing of a financially draining spring meet (marred by inclement weather and fewer bookmakers in attendance), the Louisville Jockey Club, as Churchill Downs was known in its earliest form, was on the brink of bankruptcy. At that time, Col. Meriwether Lewis Clark Jr., grandson of the famous explorer William Clark, was the Jockey Club's president. An irascible impresario, Clark had developed a deep love for the sport that not only kept the track in existence but also brought Louisville into prominence in the Sport of Kings. But his situation as the Jockey Club proved dire. "The stockholders and merchants would not support the enterprise and I have become discouraged and almost disgusted," Clark told the Courier-Journal in August 1894. "I believe the people of Louisville will realize, when too late, what they have lost by failing to assist the Jockey Club." A syndicate of investors (two of the six initial stockholders were bookmakers by profession), headed by William F. Schulte, purchased the track in late summer of 1894 and, with large hopes, organized the New Louisville Jockey Club. A Usd 100,000 renovation was begun that fall, and because the fall meeting had been canceled due to financial straights, the remodeled racecourse would be unveiled on Derby Day in 1895. The new owners contracted with the architectural firm, D.X. Murphy & Brother (now Luckett & Farley, architect of the track's most recent renovations). As a means of ushering in a new era, the track's layout was inverted: The new grandstand was relocated to the west side of the track from what is today the backside; the backside was moved from the west side (today's frontside) to the east. This new configuration shielded patrons from the glare of the afternoon sun and placed 20 new stables downwind. The grandstand was 250 feet long, constructed of red brick (now painted white), stone, and steel, and had a seating capacity of 4,500. With a 15-foot retaining wall, its lowest seats were higher than the highest seats in the former grandstand, affording spectators and excellent view. ("There can not be trick played but it may be plainly seen," crowed the Louisville Commercial, May 6, 1895, "and the people as weel as the judges will be able to tell wether the best horse has won.") Six separates staircases, no longer in existence, led up to the stands from a bricked walkaway adjacent to the track. 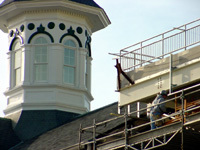 The stairs could accomodate 1,500 standing patrons, bulging the grandstand's total capacity to 6,000. 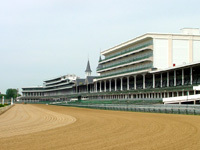 The construction of the grandstand and Twin Spires was completed in April 1895 at a cost of Usd 42,000. For the 1895 Derby, grandstand tickets cost a dollar, although ladies could get in for 50 cents. Patrons had to pay Usd 1,50 for the paddock area, but the infield was free. The newspaper accounts of the day briefly mentioned the Twin Spires. The amenities at the newly configured racetrack - the fixtures beneath the grandstand, not above it - were the focus of attention: the bar, restaurant, bathrooms, telegraph office, barbershop, and attached betting shed. The race itself failed to inspire the same awe as these comforts. Of the 57 horses nominated for the Derby, only four horses contested the race. Lexington's Halma, the 1-3 favorite, led form star to the finish easily to win the mile and a half race (the distance was changed to a mile and a quarter the following year) and the Usd 2970 prize. The black colt ridden by a 15-year-old African-American Jockey, James "Soup" Perkins, who wore the green-and-orange silks of owner-trainer Byron McClelland became the first Derby winner to sail under the wire in the shadows of the Twin Spires. But the 1895 Derby was significant because Louisville, then a city of some 160,000, had entered a new era of racing and the people, 25,000 strong, flocked to Churchill Downs to support it. Although somewhat overlooked that day, the Twin Spires eventually came to symbolize the world's most famous horse race, rising in prominence as the sport grew more popular. Today the Twin Spires are beacons, symbols of the sport and all that makes it compelling - the stregth, the competition, the beauty, the tradition. When Derby Day of 1895 closed, the Courier-Journal summed up the occasion this way: "Louisville is once more a racing center ... The glory of Churchill Downs was obscured, but is once more brilliant." What better beacon than the Twin Spires? We all believe we own a little bit of Churchill Downs. So, "What were they thinking?" might be the first words to tumble from people's mouth when they see the completely renovated track, rising like a modern-day Taj Mahal in south Louisville. 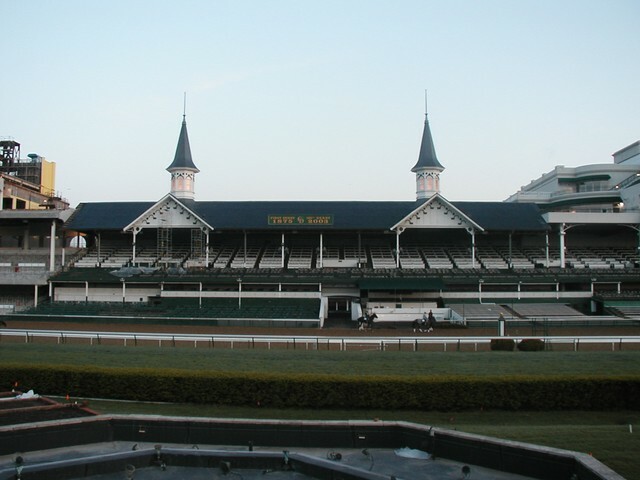 Churchill Downs is nearing the end of its two-phased "master plan." The Usd 26,000,000 phase I - 64 luxury suites on three floors added to the existing grandstand - was finished in fall 2003 (If you are standing in the paddock area, note the beefy tower to the left of the spires. The pi�ce de r�sistence, however, es phase II (the tower to the right), to be completed in April 2005. Phase II has taken two years, cost Usd 95,000,000, and incorporated 9 million pounds of structural steel. Its features include at least 12 sixth-floor luxury suites; a 22,300-square-foot private Turf Club & Lounge; a new Twin Spires Club Room for "Gold & Platinum" members; a new Millionaire's Row and Skye Terrace; enormous balconies with panomaric views of the track and paddock area; a simulcast theater complete with individual customer betting carrels; and a 50 percent increase in restroom facilities. The master plan is the largest renovation ever at the racetrack, but it has not come without some criticism by socalled purists who feel that the fabled racetrack's Twin Spires are now overshadowed. But if you are fortunate enough to stand at track level and gaze up, you might change your mind about those twin towers cozying up to the Twin Spires. 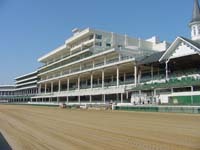 Yes, the additions are massive (404,000 total square feet of new space, with 2,800 additional seats, for a total capacity of more than 51,000), but they are terraced away from the Twin Spires respectfully, and viewed up close the don't obscure the historical aspects of Churchill Downs. The racetrack has always been a patch quilt of utility, and what Churchill Downs has done is replace much of the patches with uniformity, taking great lengths in the renovation to reveal extensive portions of the original 1895 grandstand. Certainly, some of the ritual and seedy charm is forfeited, but you're substituting quality, and pretty soon all the antiquated nuances you thought were charming (anyone recall the track's old bathrooms?) will be a faint memory. As you glimpse the completed track for the first time this spring, remember: Churchill Downs has modernized the historic track not for the 131st Kentucky Derby, but rather to ensure the glory of the 231st.